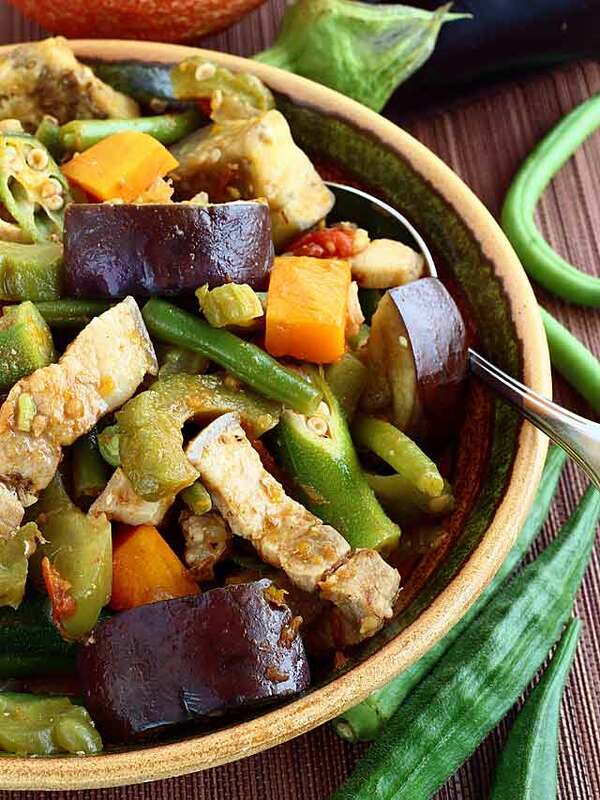 Pinakbet or Pakbet is a Filipino vegetable dish that is flavorful as it is colorful. A medley of local vegetables like squash, eggplant, okra, yard-long beans, and bitter melon. Pork, shrimp paste, and tomatoes are used to give it its distinctive taste. 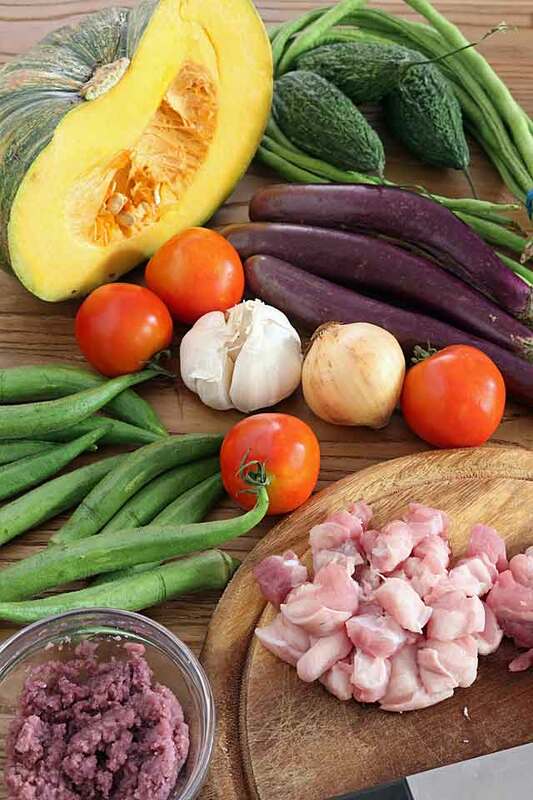 This Pinakbet recipe was originally published in 2016. Updated in 2019 to include new photos and additional tips. My mama usually cooks Pinakbet for lunch or dinner as a side dish to fried fish or other fried meat. As kids, my siblings and I would try to wiggle our way out from eating our portion. We especially hated the bitter melon. But all attempts were to no success. I remember my sister, Glenda, once tried to hide her bitter melons under her pile of leftover fish, but of course she got busted and had to eat the rest. I do not know if any kid likes or ever liked bitter melon right from the start, but it does grow on you and as we grew older we got to appreciate this very healthy dish. While living abroad, eating Pinakbet has been a real treat. I had to wait for the right time that all the veggies needed are available at the same time. The squash and eggplant I can buy locally. But the rest of the vegetables like okra, bitter melon, and yard-long beans I can only get in Asian stores. 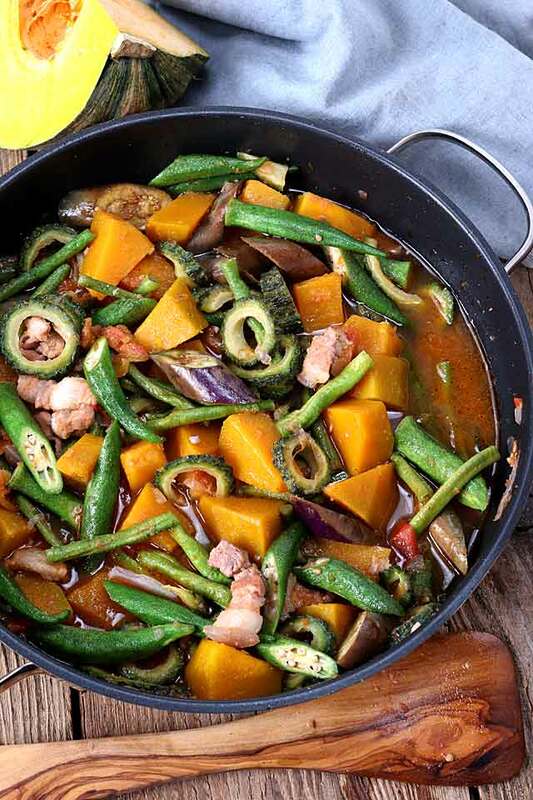 Pinakbet or Pakbet is a mixed vegetable stew with pork slices that originally came from the Ilocos region. 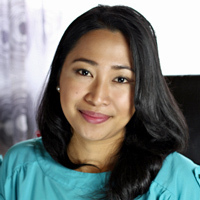 The original Ilocano version uses “bagoong isda” which is a sauce made with fermented fish. As the dish became popular in the surrounding areas, different versions took root. The Pinakbet Tagalog, which is how the version from south of Ilocos (Manila and adjacent areas) is called, uses shrimp paste for flavor. This recipe here is the latter. Brown pork in hot oil. Add the vegetables and water. Quickest vegetable to cook comes last. Cook until vegetables are tender. Vegetables are added depending on how long they cook. Those that take longer come in first. Usually, in this order: squash then bitter gourd, eggplants and yard-long beans and lastly the young okra. If vegetables are more mature they will also take longer to cook. Cut all vegetables in the same size as much as possible. Not only will it look nice but also so they all cook evenly and avoid others from getting mushy while waiting for the rest to cook. To lessen the bitterness of bitter gourd, soak cut slices in water with a little salt for 30 minutes before cooking. 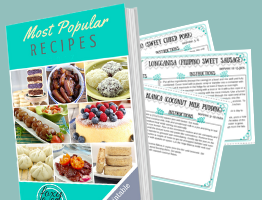 Use uncooked shrimp paste if you can. The cooked ones in jars (usually labeled as ‘ginisang bagoong’) are normally used as dips and has (a lot of) sugar in them. Pinakbet is a usual dish on of the everyday Filipino table. 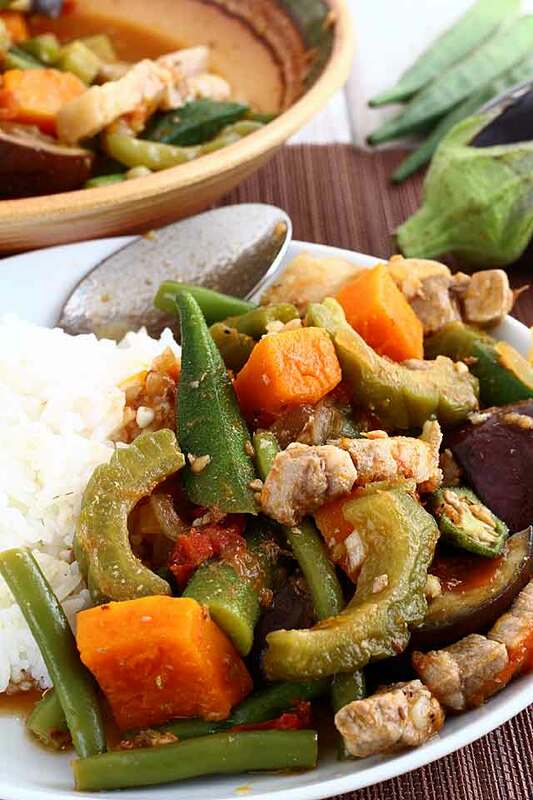 A vegetable-pork stew made from a mix of local vegetables like squash, eggplant, okra, yard-long beans, and bitter gourd distinctly flavored with shrimp paste. In a wok or pan, heat oil over medium-high heat. Add pork and cook until browned and fat rendered. Add shrimp paste and continue to cook for about a minute. Add squash and water. Cover the pan and let it simmer for about 2 minutes. Add yard-long beans, bitter gourd, and eggplant. Season with salt if needed. Cook for about 2 minutes. Add the okra and cook for another 2 minutes or until vegetables are tender yet still a bit crisp. Transfer to a serving plate and serve with rice and your favorite fried meat. love the website. I love your Pinakbet. My wife wants to try your empanada recipe. She loves empanadas. She is Irish-Welsh descent. **shimp – it think that’s a mispell on the Pinakbet recipe. 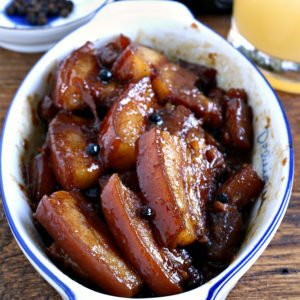 Thank you for this great recipe..We liked it very much!